I didn't watch Thursday's Senate Judiciairy Committee hearings on Brett Kavanaugh, but seeing the highlights on the evening news, particularly the testimony of Christine Blasey Ford, made me wonder if it was time not for America to pack the Supreme Court but for America to pack it all in. Dr. Ford - I know I called her Mrs. Ford before, but it turns out that she's a psychiatrist, so she's an M.D., hence the change of salutation - was credible and calm in discussing her story of how Trump's Supreme Court nominee assaulted her. Kavanaugh - who does not deserve a salutation - went on a partisan rant, blaming the Democrats for smear campaign against him and suggesting an attempt to get even for Hillary Clinton's loss to Trump. The joke's on him - it was revenge for what happened to Merrick Garland, the Obama nominee who never got a hearing, and as far as revenge for Hillary, those of us who supported Bernie Sanders or Martin O'Malley have been pining for revenge against Hillary. Or at least against Debbie Wasserman Schultz. 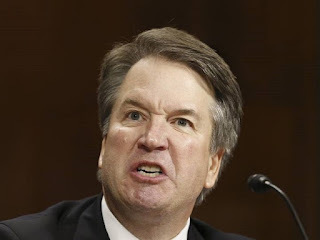 Anyway, Kavanaugh came across as a mean, vicious, self-absorbed preppie snob who is all too happy to point the finger at someone else when he's held to task for his swinish behavior. Some people compared his testimony to Clarence Thomas' response to sexual harassment charges in 1991, but I saw the Thomas hearings, and I'm here to tell you - and as someone who believed Anita Hill - that Thomas' response was measured and firm by comparison. Thomas, for all his pseudo-righteous pseudo-indignation, did not come across as someone who was about to fly off the handle. Kavanaugh came across as an anger-management course dropout. And, given his obvious fondness for beer, how many brewskis did he have before the hearing? Things would have gotten even worse yesterday, when the Senate Judiciary Committee voted to recommend Judge K's nomination to the full Senate, but Republican Senator Jeff Flake of Arizona made it clear that he wouldn't vote for final confirmation unless the FBI did a background check on Kavanuagh - which should have been done long ago and which Trump did not want. There will be a background check, and the confirmation vote will be delayed for at least a week. Hope springs eternal for those seeking to stop Judge K with enough votes in the Senate against him. But should he be confirmed, the only way to get him off the Court is to force him to resign after more crap about him comes out. But whatever happens, I'm glad I have a passport.